Tow up to 8,000 lbs with supreme safety and the convenience of an adjustable 5-1/2" drop and 6-1/2" rise with the Rapid Hitch ball mount system. Includes zinc-plated steel ball combo (1-7/8" and 2"). Fits 2" hitches. Call 800-298-8924 to order Andersen ball mounts part number AM3411 or order online at etrailer.com. Free expert support on all Andersen products. Guaranteed Lowest Price and Fastest Shipping for Rapid Hitch Adjustable Aluminum Ball Mount Kit - 2 Zinc Balls - 5-1/2" Drop, 6-1/2" Rise. Ball Mounts reviews from real customers. 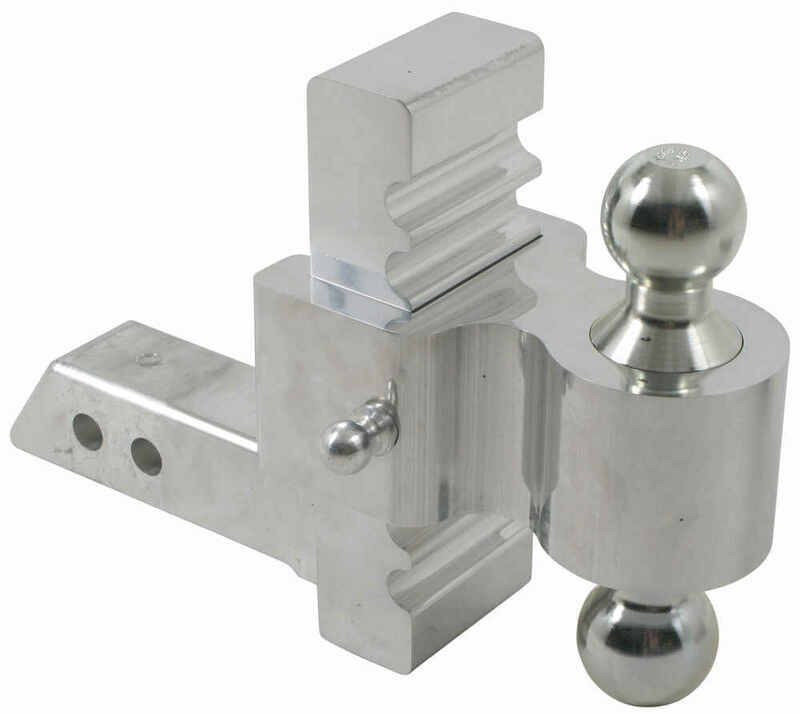 Switch easily between trailers with this adjustable, solid steel ball mount. Go from a 6" drop to a 7" rise. Tow up to 12,000 lbs with either the 2" or 2-5/16" ball. Forged steel shank is powder coated for corrosion resistance. Tow up to 10,000 lbs with supreme safety and the convenience of an adjustable 5-1/2" drop and 6-1/2" rise with the Rapid Hitch ball mount system. Includes greaseless aluminum ball combo (2" and 2-5/16"). Fits 2" hitches. Today, we'll be reviewing part number AM3411. This is the Rapid Hitch Adjustable Aluminum Ball Mount Kit. It's going to come with two chrome balls. You're going to have a 2 inch ball and a 1-7/8 inch ball and before we really get into some detail, I just want to go ahead and show you how to assemble this. When you get it in the box, it's all going to come pieced out like this so this is going to be your platform. This is your adjustable mount. First thing you need to do is decided which ball you want to use. The platform can be adjusted either way so really, your main thing is just to get the ball mount inside the platform and then you can flip the platform over as needed depending on which size hitch ball you want to use. We're just lining up the pinholes here at the back. You can see that there's a pinhole here. We're lining it up with the pinhole of the hitch ball. Once we get that in line, we can take our pin, place it through. Thats going to hold the ball inside the platform. Next step is to go ahead and set it under the adjustable part and for our application today, we're going to go and set it at the lowest setting. You can see that it will adjust all the way up and down and it will adjust to increments of 1 inch. Once we have our location set, we'll take our other pin. Place it through and secure it with the clip on the other side. Just like that, we're ready to install it on to our vehicle and get it secured and hooked up and ready to go. This is fully adjustable. It's got aluminum alloy construction so it's going to be very durable, very lightweight and it's going to stand up really well against rust and corrosion. The ball mount again will adjust to increments of 1 inch. It's going to allow towing of various trailers without having to switch between different hitch balls so you can use this system to haul a variety of trailers with different tongue heights. Here at the rear of the shank, it's going to feature two hitch pinhole locations that just allows for further adjustability. It's going to come with the two chrome plated steel hitch balls. Additional ball sizes can be purchased to replace the originals if you need a different size. Then to get this secured inside your hitch, you're going to need a hitch pin and clip or a hitch pin lock. Thats going to be sold separately. You can find those on our website so check out etrailer.com for some more options if you don't already have one. This is designed to fit a 2 inch by 2 inch trailer hitch receiver. It's also going to be compatible with 2-1/2 inch by 2-1/2 inch hitches but you'll have to use a 2-1/2 inch to 2 inch adapter sleeve and that is sold separately as well. The towing capacity when using the 2 inch ball is going to be 8,000 pounds. When using the 1-7/8 inch ball, it's going to be 7,500 pounds. With it installed at the lowest setting, it's going to give us a maximum drop from the ball platform to the inside top edge of the receiver to the rear hitch of 5-1/2 inches. You can flip it over to the rise position. It's going to give you a maximum rise of 6-1/2 inches. If we take a measurement from the center of the closest hitch pinhole to the center of the ball hole, thats going to give us a measurement of 8-1/4 of an inch. We go to the rear pinhole to the center of the ball hole, thats going to give us a measurement of 9-5/8 of an inch. Now the distance that we have from the center of the hitch pinhole to the back of this upright portion, again measuring from the closest pinhole, it's going to be about 2-1/2 inches and then from this other pinhole, thats going to measure about 4 inches. That measurement is important because you want to make sure you have enough room between the actual platform of the mount and the rear most part of our vehicle. It also got the nice slanted shank here at the back so it's going to allow this to slide in and out of the hitch very easy. A couple more measurements, if I take a measurement from the rear pinhole to the end of the shank, thats going to give us a measurement of 2-1/4 of an inch. Measuring from the other pinhole location to the rear of the shank, thats going to give us a measurement of about 3-1/2 inches. Thats going to do it for today's review of part number AM3411. 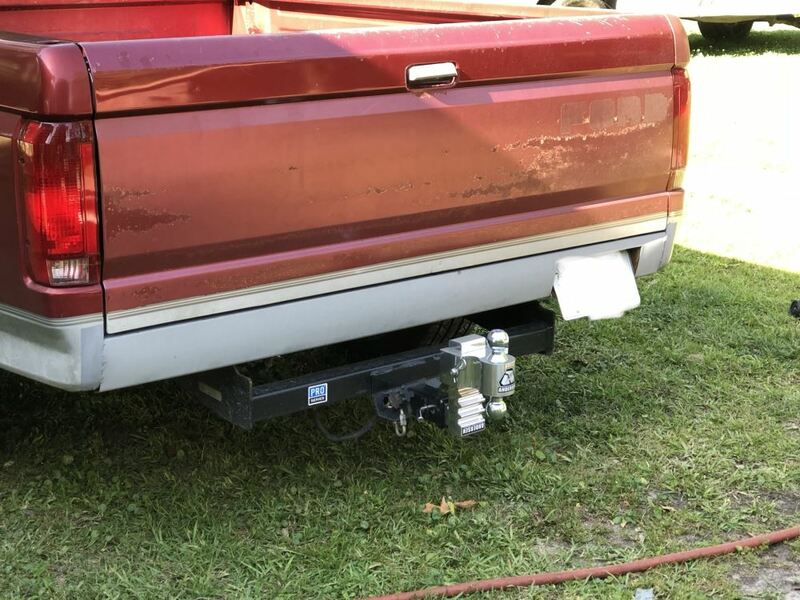 This is the Rapid Hitch Adjustable Aluminum Ball Mount. .
Order: RelevanceNewestRating - High to LowRating - Low to High Tow up to 8,000 lbs with supreme safety and the convenience of an adjustable 5-1/2" drop and 6-1/2" rise with the Rapid Hitch ball mount system. 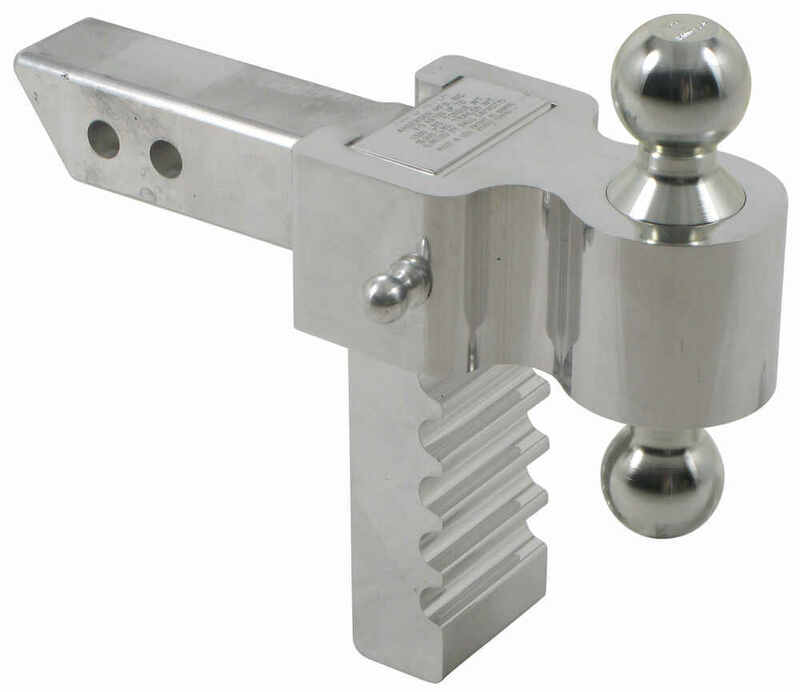 Includes zinc-plated steel ball combo (1-7/8" and 2"). Fits 2" hitches. 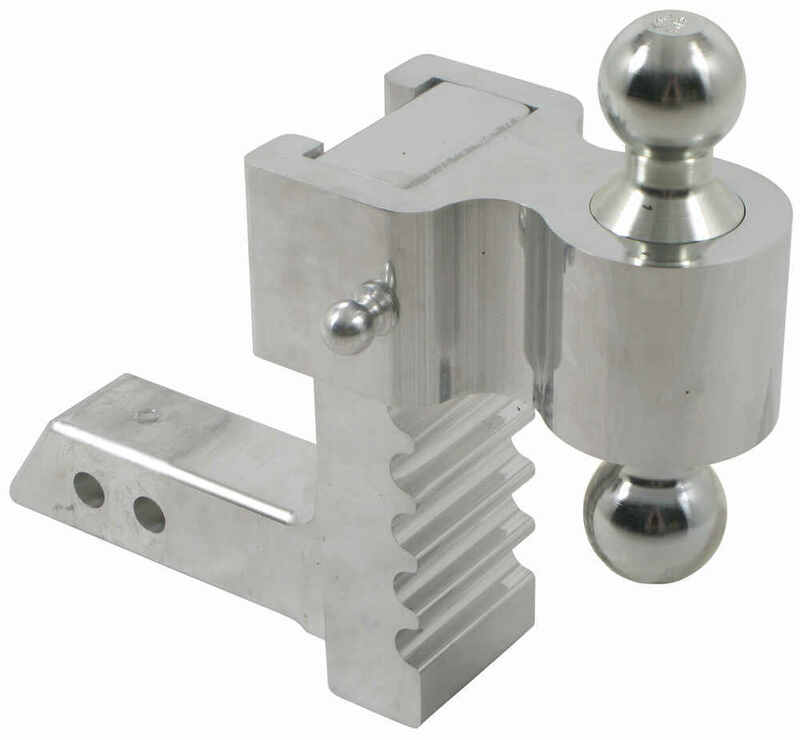 We do have replacement parts for your Rapid Hitch adjustable aluminum ball mount kit. For a replacement ball housing you will want part # AM3423. 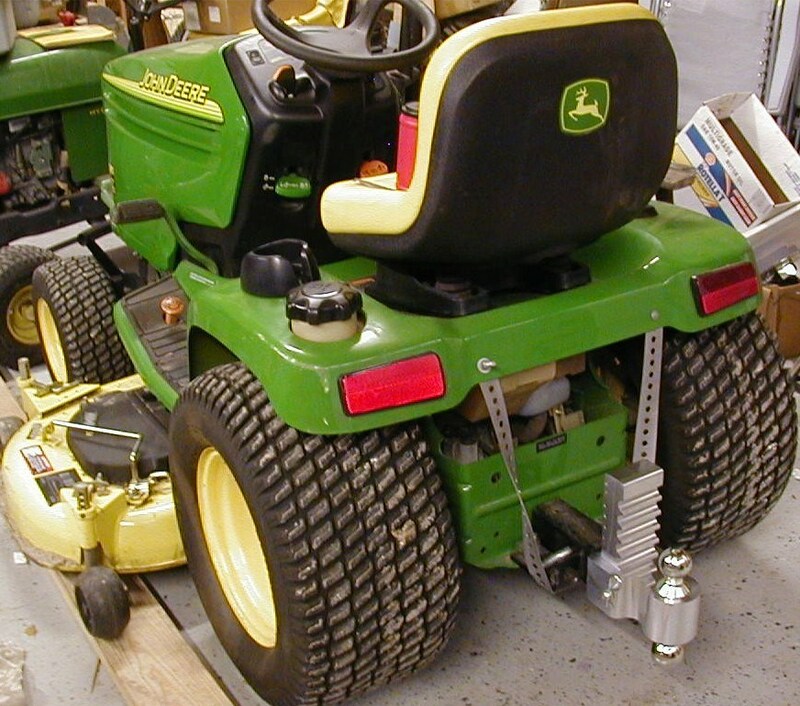 For a replacement ball combo with 1-7/8" and 2" hitch balls you will want part # AM3436. For a replacement adjustment pin and clip you will want part # AM3431. For the latest prices, check out the product page for each part. For the Rapid Hitch Adjustable Ball Mount, # AM3411, I recommend the Rapid Hitch Trailer Hitch Lock and Adjustable Pin Lock Set, # AM3492. This lock set is designed to be used with the Rapid Hitch ball mounts and the pins are keyed alike so you will only need one key between both locks. 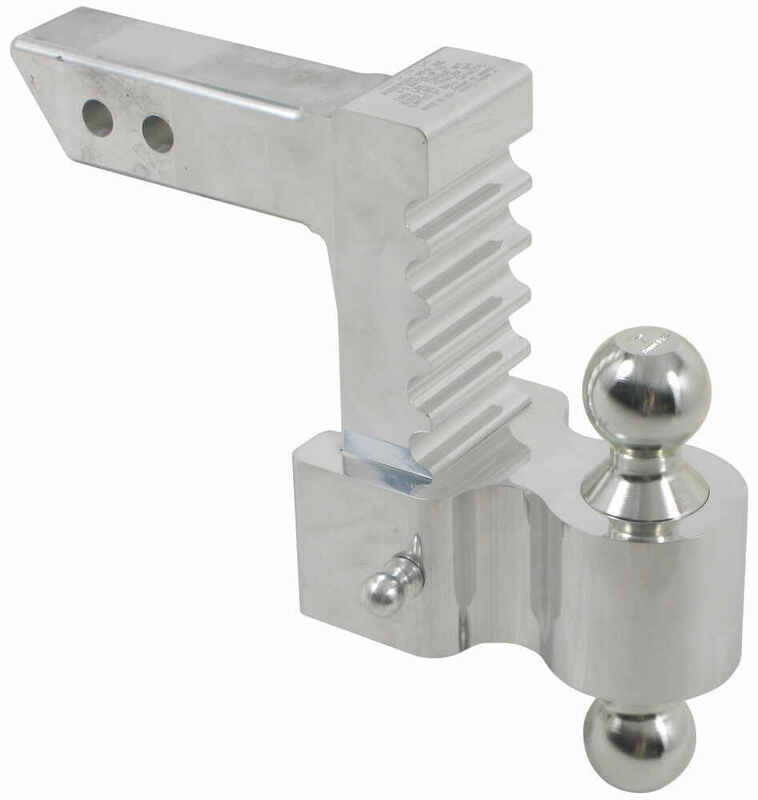 We do have just the shank part of the Andersen Rapid Hitch adjustable ball mount # AM3411. 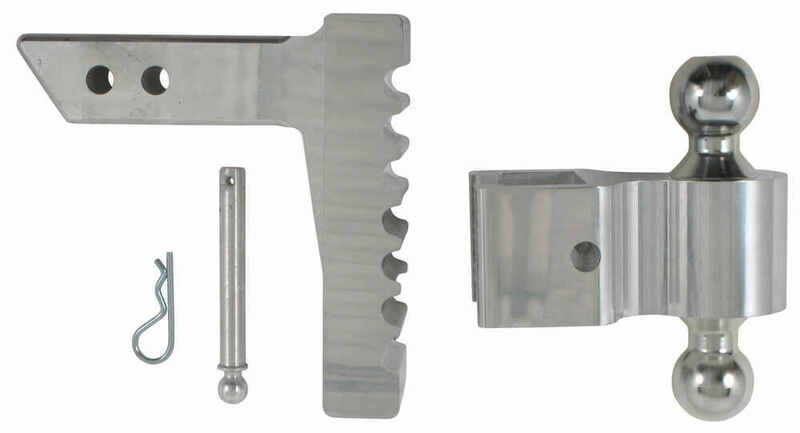 You will need replacement shank # AM3422. It has the same maximum rise of 6-1/2 inches and maximum drop of 5-1/2 inches, adjustable in 1 inch increments. The correct double ball replacement you'd need for your Rapid Hitch Adjustable Ball Mount part # AM3411 is the part # AM3435. The part # TB02 is only a fit for the Weigh Safe ball mounts. The Rapid Hitch adjustable ball mount # AM3411 you referenced, will have a tongue weight capacity of 1,500 pounds. I included a video review about the Rapid Hitch and an informative article about tongue weight for you too. Yes, the replacement cap for the Rapid Greaseless Alumiball Combo part # AM3436 you have on your Rapid Hitch Adjustable Aluminum Ball Mount part # AM3411 is the Replacement Nylon Cap for Greaseless HardBall Hitch Ball with 2" Diameter part # AM3664-2. There is only one adjustable ball mount that has a 2 inch ball on one side of the platform and a 1-7/8 inch on the other. For that you would need the Rapid Hitch part # AM3411. This is an aluminum setup too so it will not corrode either. I have a solution for you, but if you need up to an 8 inch drop the Andersen ball mount part # AM3411 that you referenced can only do a max drop of 5-1/2 inches. For a similar adjustable ball mount that can do up to 8 inches you would want the part # DTSTBM6800 instead. 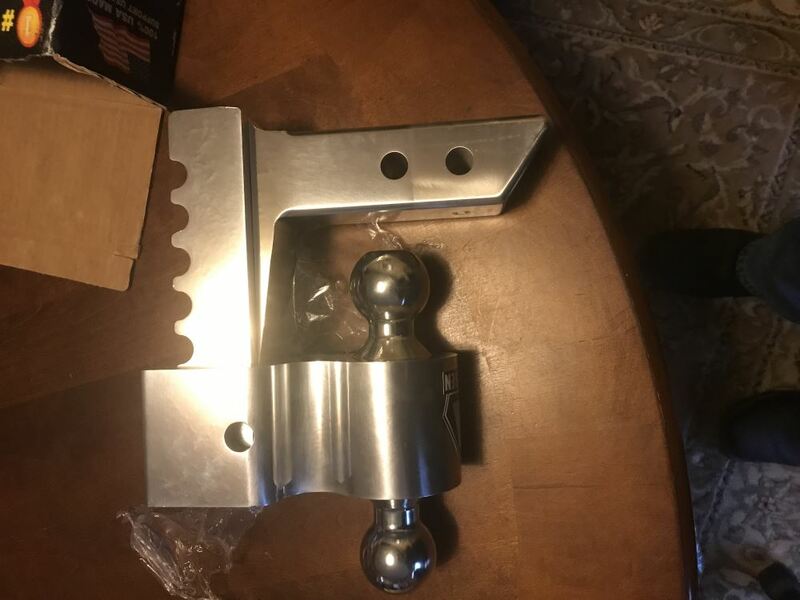 For an aluminum adjustable ball mount that has both a 2 inch and a 1-7/8 inch hitch ball you would want the Rapid Hitch part # AM3411 which has those two ball sizes. I attached a review video for you to check out as well.